Are global bond managers ready for the operational challenges of the China onshore market? Until now, only investors who recognized that China's onshore CNY bond market offers a unique opportunity to gain access to the country's long-term growth story had to think about the considerable operational challenges that investing there entails. That will all change in just a few weeks' time, when China onshore government and policy bank securities are included in the Bloomberg-Barclays Global Aggregate Bond Index. It has been estimated that the inclusion of China's local bonds in all three of these global bond indices could bring an inflow totaling $286 billion over three years. That will all change in just a few weeks' time, when China onshore government and policy bank securities are included in the Bloomberg-Barclays Global Aggregate Bond Index. The allocation will be phased in over 20 months, by which time almost 400 Chinese securities are expected to represent 6.03% of the index, making the renminbi its fourth-largest currency component behind the U.S. dollar, the euro and the Japanese yen. At the same time, Bloomberg-Barclays will add China onshore bonds to its Global Treasury and Emerging Market Local Currency Government Indices. We expect JPMorgan to add them to its GBI-EM Global Diversified Index by 2020, and FTSE Russell to follow suit in its FTSE World Government Bond Index (WGBI) by 2021. Taken together, these indices benchmark a vast amount of global fixed income portfolios, both passive and actively managed. While Bloomberg will create ex-China versions of its affected indices, it appears likely that most asset managers will want to maintain the full-market benchmarks - which means getting up to speed with the particular challenges of trading and investing in China onshore bonds. The first way is to register with the Qualified Foreign Institutional Investor program (QFII) and/or the Renminbi Qualified Foreign Institutional Investor program (RQFII), which are subject to quota approvals. The second way is to register with the People's Bank of China's (PBoC) Interbank Direct Investment Program (CIBM), which is not quota-restricted. Both require an onshore custodian and cash account and subject the investor to China onshore regulation. The most straightforward route is the third: Bond Connect. Launched in 2017 as a joint venture between the China Foreign Exchange Trade System (CFETS, the PBoC's trading platform) and the Hong Kong Monetary Authority (HKMA), this channel enables international investors to trade on global trading platforms linked with CFETS, with their assets held at global custodians who are members of Hong Kong's Central Moneymarkets Unit (CMU), via a nominee structure with an onshore clearinghouse. Both TradeWeb and Bloomberg have been approved as trading platforms for the channel. We expect Bond Connect to be the most favored by the huge number of new foreign investors set to enter the market from April onwards. In time, it should become the least operationally burdensome route, and the fact that Bloomberg-Barclays is pressing ahead with its April index phase-in date indicates that it is confident that global fixed income investors can cope with the challenges involved. But the challenges remain real, nonetheless. Global custodians are still working with regulators in Mainland China and Hong Kong to fix operational setup issues, including difficulties around onshore foreign-exchange hedging. The launch of delivery-vs.-payment settlement in August last year helped to make the market eligible for UCITS vehicles, but the Irish Central Bank, which regulates Ireland-domiciled UCITS, is still looking for further assurance that fund assets may not be safe in the event of failures in the system or by participants in the system. In addition, there are ongoing concerns about liquidity in off-the-run bonds due to a lack of active secondary-market traders and the fact that local banks hold almost two-thirds of the market. Of course, this is something of a "chicken-and-egg" problem, and it may be solved as demand from international investors increases. China is also seeking to improve liquidity in government bonds by issuing fewer lines but re-tapping the market more often, which will result in significantly larger outstanding amounts of each bond than we see currently - but this remains a long-term work in progress. Finally, while investors have welcomed the recently granted three-year waiver of tax on local-bond income, there is still a lack of clarity as to what will happen on tax collection once those three years are up. It has been estimated that the inclusion of China's local bonds in all three of these global bond indices could bring an inflow totaling $286 billion over three years (figure 1). For reference, at the end of 2018, the total outstanding value of Central Government Bonds (CGBs) and Policy Bank Financial Bonds (PFBs) stood at $2.2 trillion and $2.6 trillion, respectively. 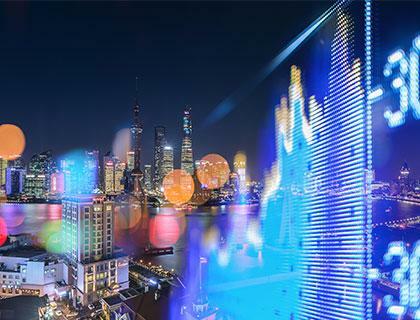 At Neuberger Berman, we have been very encouraged and excited by the historic opening up of the Chinese onshore bond markets, and, like the index providers, we have been preparing for this opportunity. Our Emerging Markets Debt team now has five dedicated fixed income professionals on the ground in Shanghai, focusing on duration and all variations of corporate and credit opportunities in RMB. Next to that, in close coordination and cooperation with Shanghai, we continue to focus on Chinese issuers of dollar-denominated bonds from our Singapore office, as we have done since 2013. We received our QFII license in 2012, our RQFII license in 2015, and in 2017, our so-called WFOE license to establish a wholly foreign-owned asset management enterprise onshore in Shanghai, as well as our private fund license for the China onshore bond market. Our products now include a private onshore fund catering to domestic investors and a China onshore bond UCITS that launched back in September 2015; these are total return-oriented funds. We also continue to manage a China onshore government bond benchmark-aware strategy, which now has a track record of more than three years. We firmly believe that the inclusion of Chinese onshore bonds into global bond indices will not only transform this market but also the portfolios and the day-to-day operations of global fixed income managers around the world. One of the reasons Neuberger Berman established its China onshore bond capabilities and funds was precisely to give the managers of its global emerging markets strategies a simple and robust way into this market, way ahead of its inclusion in their benchmarks. Given its particular operational challenges, we believe all global fixed income investors will need to find partners that are similarly well prepared to help them gain access and capture these new opportunities. This material is provided for informational purposes only and nothing herein constitutes investment, legal, accounting or tax advice, or a recommendation to buy, sell or hold a security. Information is obtained from sources deemed reliable, but there is no representation or warranty as to its accuracy, completeness or reliability. All information is current as of the date of this material and is subject to change without notice. Any views or opinions expressed may not reflect those of the firm as a whole. Neuberger Berman products and services may not be available in all jurisdictions or to all client types. Investing entails risks, including possible loss of principal. Investments in hedge funds and private equity are speculative and involve a higher degree of risk than more traditional investments. Investments in hedge funds and private equity are intended for sophisticated investors only. Indexes are unmanaged and are not available for direct investment. Past performance is no guarantee of future results. Firm data, including employee and assets under management figures, reflect collective data for the various affiliated investment advisers that are subsidiaries of Neuberger Berman Group LLC (the "firm"). Firm history and timelines include the history and business expansions of all firm subsidiaries, including predecessor entities and acquisition entities. Investment professionals referenced include portfolio managers, research analysts/associates, traders, and product specialists and team-dedicated economists/strategists.